Japan's Venus orbiter has witnessed a huge atmospheric wave that spans the globe. An artist's conception of JAXA's Akatsuki spacecraft at Venus. A monster wave roils in the atmosphere of Venus. The Akatsuki orbiter team, under the Japanese Aerospace Exploration Agency (JAXA), recently revealed images of the huge bow-shaped wave in the upper atmosphere of Venus. The finding comes from data Akatsuki gathered in late December 2015 and early January 2016, shortly after orbital insertion. The team released the results on January 16th in Nature Geoscience. 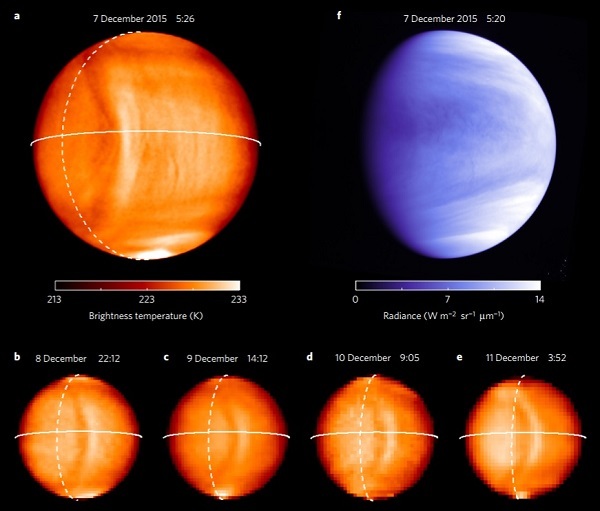 The spacecraft's Longwave Infrared Camera (LIR) and the Ultraviolet Imager (UVI) captured the images of the Venusian atmosphere. Anatomy on a gravity wave on Venus. The orange images were captured by Atkatsuki's Longwave Infrared Camera (LIR), while the blue upper right image is from the spacecraft's Ultraviolet Imager (UVI). The solid line marks the planet's equator, while the dashed line denotes the day-night terminator. The bow-shaped feature spans the Venusian cloudtops from hemisphere to hemisphere, more than 6,200 miles (10,000 km) long. Although the cloud tops whip along at 100 meters per second (200 mph) — much faster than the slow-moving surface of the planet below — the curious structure seems to stay in lockstep with the rotation of the planet, suggesting a complex (and previously unsuspected) interplay between the mountainous surface and the sulfurous cloudtops. The structure appeared near the evening terminator on the daytime side of Venus. This data shows the gravity wave in motion, as observed by Akatsuki. It's unclear at this point just how common such a wave is. When Akatsuki looked back at the region later in 2016, the wave had, for the most part, vanished. A solar system oddball, Venus rotates retrograde (backward) once every 243 Earth days, longer than its 225 day orbital path around the Sun — its day is longer than its year. You could outrun sunrise and sunset on Venus if, of course, you could find a way to avoid getting simultaneously fried by the 864° Fahrenheit (462° Celsius) surface temperatures and crushed under an atmospheric pressure more than 90 times that of Earth's at sea level. The atmosphere consists almost entirely of carbon dioxide, with some nitrogen and sulfur dioxide. The wave that Akatsuki detected is embedded in the cloud interface layer between the upper troposphere and the lower stratosphere. Computer models run by the the team, led by Makoto Taguchi (Rikkyo University, Tokyo), suggest that air flowing over the mountainous terrain produces a gravity wave that then propagates upward to the cloud tops, where the large bow wave is seen. We see similar gravity wave phenomena here on the Earth, though not on such a large scale. NASA's New Horizons spacecraft also chronicled evidence for gravity waves in the atmosphere of Pluto during its historic 2015 flyby. It's worth noting that gravity waves propagated through a planetary atmosphere are a distinct and separate phenomenon from gravitational waves, ripples in spacetime produced when black holes merge (among other events) detected by LIGO. Gravity waves seen in the atmosphere of Earth. 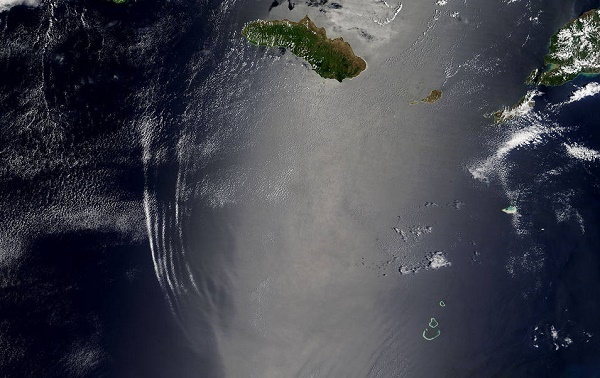 The longitude of the bow-shaped wave corresponds with the western slope of the Aphrodite Terra highlands below, which NASA's Magellan spacecraft first mapped starting in 1990. The wave is warmer than the surrounding atmosphere and is brightest around 230 Kelvin (–40°C/F). Meaning “Dawn” or “Daybreak” in Japanese, Akatsuki was launched atop an H IIA rocket from Tanegashima, Japan, along with the IKAROS solar-sail demonstration mission on May 20, 2010. 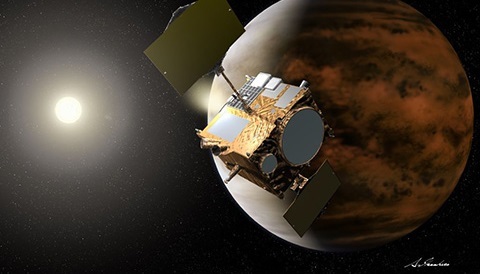 Akatsuki took the long road, as the spacecraft missed getting into orbit in late 2010 and had to wait until early December 2015 to enter orbit around Venus. 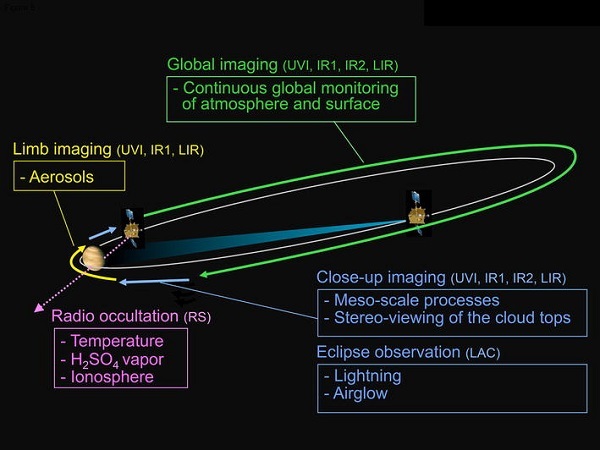 Observation phases for the Akatsuki mission along its elliptical orbit. Akatsuki currently takes 9 days to orbit Venus, traveling from an apocytherion (farthest point) of 270,000 miles (440,000 km, just a little farther than the Earth-Moon distance) to a pericytherion (closest approach) of just 250 mi (440 km, the orbital altitude of the International Space Station) above the Venusian cloudtops. Akatsuki is currently the only robotic emissary in operation around Venus. The recent Discovery-class mission selections by NASA passed over two Venus mission proposals, in favor of the Lucy and Psyche missions. There is, however, a Venus proposal (the Venus In Situ Explorer, featuring an atmospheric probe and lander) in the running for the initial round of New Frontiers selections expected to be announced this coming November, with a final selection slated for 2019. Now is also a great time to spy Venus at dusk, as the planet just passed greatest elongation on January 12th and is paired with Mars through the end of the month. And speaking of amateur observations of Venus, skilled astro-imagers have managed to tease out actual detail on the Venusian cloudtops and even the surface of Venus using infrared and ultraviolet filters . . . though unfortunately, “Akatsuki's wave” is elusive at the wavelength favored by amateur imagers. We're starting to appreciate just how complex the atmospheric interaction on Venus is, thanks in part to the intrepid Akatsuki spacecraft.